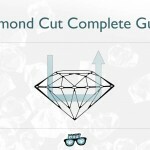 What Is Diamond Cut All About? Find Out Right Now! The cut is the true soul of a diamond! Even though most shoppers prefer concentrating in Size, Clarity or Color as the most important factors, a cut is truly what makes a diamond sparkle and shine. Diamond cut is the one factor that is often under-appreciated by diamond shoppers and it should change. The quality diamond cut means great proportions of facets placed at the right angles. A diamond with such cut is able to receive incoming light, bounce it several times against the walls of its facets, and reflect it back out into several sparkling lines of light that could wow you and potentially make you drop your jaw in amazement 🙂 That’s the ideally cut diamond. A bad cut, however, may leave you little to no impression at all. A diamond crystal that is cut far from the “ideal” agreed proportion and percentage may cause the incoming light to bump onto different “wrong” directions inside the prism of facets, and possibly leak it out from the sides or the bottom of the diamond instead of back right up to do its most important job: to awe your eyes. Prior to the 14th-century, diamonds were used in their crystal form and weren’t always used for jewelry purposes. At that time diamonds did not carry the aesthetic weight in the market and most of them had an external rough appearance that made them look unappealing. The first form of polish started in the 14th century when a form of simple polishing, which today is called the “point cut”, started. Since then many improvements occurred in diamonds cut. One of the most significant improvements happened in the beginning of the 20th century when Marcel Tolkowsky found that the Round cut could be mathematically and scientifically defined in order to achieve its best sparkle. He believed that cuts that were too deep or too shallow could result to light being reflected the wrong exit points; i.e. 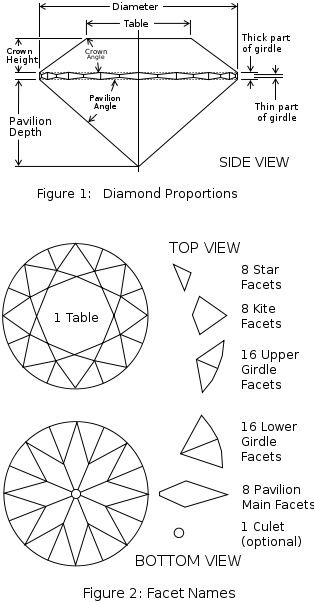 the bottom or the sides of the diamond. If this happens, the diamond loses the shine it should be having and therefore, is less valuable. That’s how the importance of diamond cut was initially found. 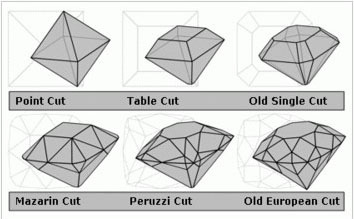 Since this breakthrough of diamond cutting knowledge, the cutting technique has improved a lot and cut grading system is developed to define how precious a diamond is, based on how accurate its cut is. Today both Gemological Institute of America (GIA) and American Gem Society (AGS) have a relatively new cut grading for this Round cut. The whole purpose of cutting a diamond well is to bring its sparkle to its best. As you just read, it took hundreds of years bringing the round cut to perfection. It is still being perfected and even more shapes are being invented once in a while in the mean time. To this day, the relatively new cut grading is composed of 4 main factors: symmetry, proportion, polish and objective light return. Symmetry and polish are considered diamond’s finish, the one that makes the diamond’s shape look nice. 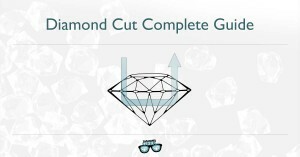 While proportion and objective light return are considered the most important in regards to diamond cut. A nicely balanced proportion allows a diamond to work the received light and return it back face-up to the viewers and simply say: To shine. Diamond consists of many facets. Facets by definition are the polished surfaces of a cut diamond, arranged at different angles to look as it is now. A round cut diamond consists of three major parts: crown (the upper part), girdle (the thin middle part that separates crown and pavilion), and pavilion (the bottom part). All these parts are made up of facets of different sizes and shapes. Symmetry value of a diamond shows how its facets are aligned from one another as these symmetrical facets will bring out the best shape of the diamond. A diamond is called to be asymmetrical when there are misshaped facets constructing it. This imperfectness usually refers to misaligned facets, certain facets not parallel with the others, wavy girdle, etc. The symmetry of a diamond affects its cut grade, value and consequently price. You don’t want to buy a diamond with poor symmetry because the asymmetry can easily be seen and one can immediately know that the stone is of the lesser quality. However, this symmetry value does not make a major effect for diamonds graded with “Good” and “Excellent”; at least by our naked eye. Therefore, if you want to make the best exercise of your purchase, don’t necessarily emphasize on buying a diamond with excellent symmetry. You can settle with the “Good” symmetry grade and allocate the fund for the more important grade: proportion. Proportion is the measurement of diamond facets. Certain measurements are believed to create a mind-boggling diamond-seeing experience as these define how good the light can be returned. Good returned light makes a beautiful diamond! 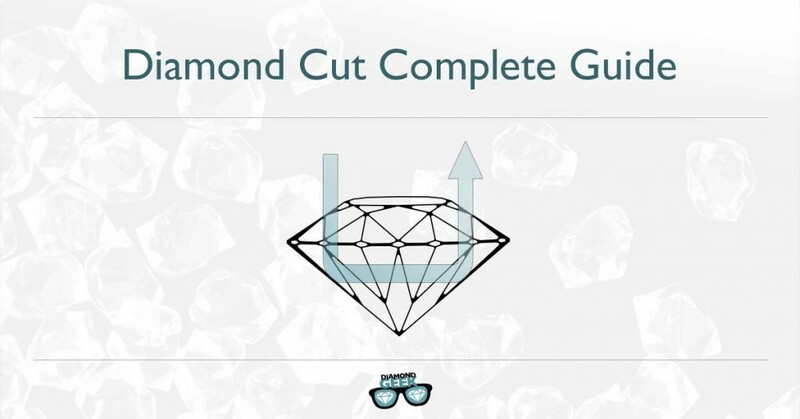 This is why proportion is the most important aspect to look at in a diamond cut quality. Now let’s take a deeper look at it. The right proportion of the table facet – the largest facet of round diamond typically placed at the center of the crown surface – will make a great external reflection for some parts of the incoming light. The other parts of the light travel further inside, hit the walls of the pavilion facets, and these small fractures of light will go right back up as white light (brightness) and/or fire (colored light). When moved, the diamond can create a dance between brightness and fire, which is called scintillation. This is when a real diamond can truly astound you. Diamond needs to be cut properly and each facet has its own ideal proportion to be able to return an excellent amount of light. A diamond that is cut too deep or too shallow will reflect the light to the wrong directions. Light exiting from anywhere but the top – mostly from the bottom or the sides – will likely fail to create that brightness, fire, and scintillation you have been expecting for. This will greatly contribute to the loss of a chance to get the genuine diamond sensation for your eyes. So if you want to get a real quality diamond, take the cut proportion into a huge consideration. This is what determines that the diamond you are buying is worth the money you are spending. When talking about polish, we are talking about the smoothness of the outer surface of a diamond. The lesser grains there are in a diamond, the better the polish grade is, and the more expensive the selling price is. There are also aspects like scratches, polish lines and other imperfectness that have possibly occurred during the cutting process. Collectively, this will give a negative effect to its polish grade as it loses clarity. However, when higher grades on diamond polish are concerned, this is in fact not more important than the symmetry factor and definitely not compared to the proportion factor. If the fund allows, you should be choosing diamonds with a medium grade of polish. This means there are few or very few of grains or diamond dust on the diamond; more often too few for our naked eyes to be able to spot them. Higher grade diamonds show a naturally smaller amount of grains, but they are only visible under a 10x magnifying glass. This range of polish grade looks awesome on the certificate that comes with the diamond, but it creates very little impact on how it looks under your own eyes’ observation. That’s why there is no point spending more money on this higher grade of polish. Stick to the medium grade and you’ll be alright. The objective light return refers to the light performance that a diamond displays. It’s achieved by the superb proportion of the cut. Most of its mechanism have been explained above. You are basically looking out for a diamond that performs a great objective light return, where you can witness the sparkle of the diamond, which consists of its brightness, fire, and scintillation. A diamond with a bad cut will lose the light it receives and consequently also lose the dazzling shine it should be reflecting to you. To help you find a diamond with a decent cut, you should be checking out the grade certification the diamond comes with. The GIA and AGS are today’s leading gemological labs whose grading is valued with minor changes. Both labs have held studies on diamond cut and both confirm that cut plays the most important role in creating the sparkle in a diamond. These labs test diamonds and grade them according to its cut value, as well as the clarity, the color, and the carat weight. Therefore, when shopping for a diamond, it is always useful to demand a certification issued by either GIA or AGS to the vendor you are dealing with. be alright. Before the cut, diamond crystals are just rough -looking stones. They may appear in different shapes and sizes with their own limitations on how a diamond cutter should work on them. That’s the reason why not all freshly mined diamonds can be perfectly cut. Most rough diamonds come in octahedron shape – a shape composed of eight equal triangles, which is an excellent base for making round diamond. But there are also other shapes that the stones originally come in. These so-called malformed, non-octahedron diamond crystals are then usually cut into fancy shapes to compromise (and gain) maximum carat weight. Fancy diamond shapes refer to any other shapes but the rounds. The market of fancy-shaped diamonds is heavily influenced by the popularity of a specific fancy cut of the time. That’s why if you buy a Princess cut now, for instance, you may not get what you originally pay for when you want to resell it in 10 years as its popularity diminishes. Round cut, on the other hand, maintains its popularity and price as it is considered the most accurate diamond cut, which gives the brightest, shiniest, and most lustrous gleam a diamond can deliver. The GIA Cut grading is the most advanced today in the industry. 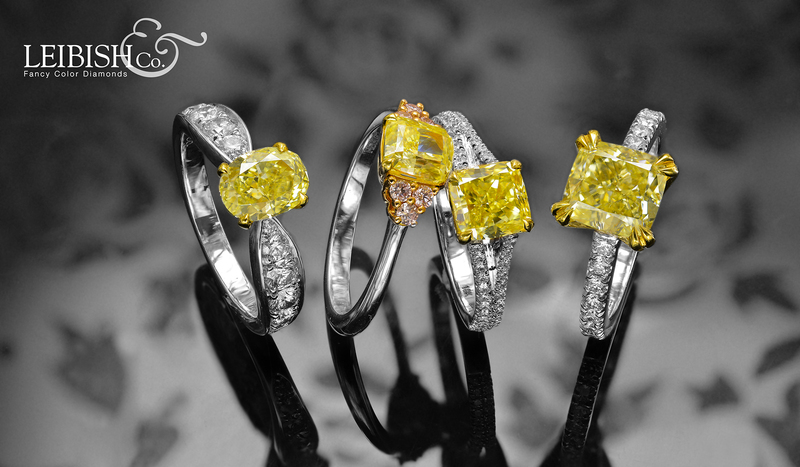 It is supported by years of experience and many experiments that the GIA have performed during the years. 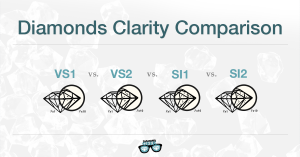 The grading is not based on “dry” numbers only but also on visual scores that different diamonds have received. GIA found that relying on a specific range of proportions only did not do a fair justice to so many different types of cut out there. There are diamonds that do not fall into this ideal cut proportion range that look and shine beautifully when coming into contact with light. So GIA developed a computerized system that replicates the behavior of light when entering a diamond and uses it to analyze how good a diamond can reflect the light. However, this computerized system does not essentially make what it grades alone as “Fair” a real fair quality diamond. When seen by human’s eyes, this “fair” graded diamond can actually be called the “good” diamond if the amount of the returned light is sufficient to astonish the viewer. Therefore, GIA adds another test involving real human’s observation to the diamonds they are grading. And this makes it their strongest grading system. According to GIA, there are largely two components that make up a diamond quality; i.e. overall appearance (face-up appearance consisting of brightness, fire, and scintillation) and design and craftsmanship (weight ratio, durability, polish and symmetry). Based on this, the grading system for a round cut diamond is broken into 5 scales; namely Poor, Fair, Good, Very Good, and Excellent. Each of these grades represents a wide range of cut proportion sets instead of limited numbered ones like how it once used to be. Although cut is the most important factor to consider when buying a diamond, the other factors that make up the overall beauty of the stone should not be forgotten. A truly beautiful diamond should have flawless cut with amazing color and clarity, too. Then we also have the carat weight, which is equally essential as this is what costs the most. It is when the Cut is graded along with the Color, the Clarity and the Carat weight (now commonly renowned as the 4 C’s). All diamond shoppers need to at least acquaint themselves with this knowledge before buying any particular type of diamond. While GIA maintains its grading system with the help of human’s perception as well as how the brightness, fire, and scintillation of the stone are under common lighting environment, it also uses its most powerful tool, which is called DiamondDock. This tool observes a diamond on a neutral gray tray under a daylight fluorescence to observe its brightness and patterned scintillation and under 5800° Kelvin l.e.d to observe the fire and sparkle scintillation. AGS, on the other hand, uses a tool called the Angular Spectrum Evaluation Tool (ASET). ASET is an advanced tool of reflector technology which color-codes a diamond’s angular ranges based on the light it absorbs. There has to be a good balance between blue, great amount of red and only some green for a diamond to get the AGS’ Ideal score of light performance. Of course, symmetry, polish, and proportion are also taken into account to achieve that grade. In the past few years, diamond buyers have been sufficiently educated about the importance of cut in a diamond, thanks to the wealth of the shared knowledge in the world’s biggest library – the internet. The old buying method that cared merely about diamond’s size, clarity and color have been shifted to 4C’s – cut, clarity, color, and carat weight – with more emphasis on the cut grade. In terms of fancy cuts, the behavior of the market relies heavily on what is popular at the moment. This makes the price of the fancy-shaped diamond goes up and down, regardless its cut value. It can’t be said enough that the cut enables diamond to look at its best. A diamond with perfect cut boosts its light performance to its most sparkling, brightest, and fieriest state. This is the state you should be after if you want to be perfectly content with what you buy. 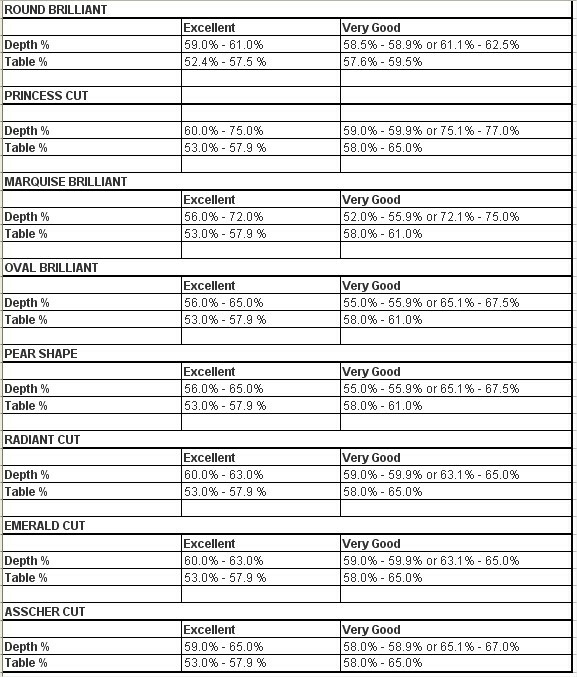 These next two tables are basic measurements tables that specify basic measurement and proportions of several diamond shapes. All that is mentioned here is only a recommendation. In order to shop a diamond right, you should buy a certified diamond. You can also contact me for an advice regarding the right Cut. There are several tables that describe ideal and recommended measurements today. Most of them are pretty accurate and should be followed when shopping for a diamond. This next table brings the most important data. However, again, one should purchase a diamond with GIA or AGS certification to ensure that they are buying the best diamond. Suppose now you have a list of diamonds that have either GIA or AGS certificates, how can you know which diamond is best to buy? If you plan to buy it online, you need to pay a good attention to the crown degrees and pavilion angles. These two aspects are not shown in GIA grading reports, but as important in determining whether the diamond has the desired returned light effect or not. Take a note on these details and test them with diamond cut appraisal tools, such as Pricescope tool and GIA tool. Pricescope has several tools that can be used to estimate the quality of different diamonds. For the round brilliant cut, the most versatile tool is the Holloway Cut Adviser (HCA), which observes the possible light return that could come out of a diamond based on the percentages of its facets and the degree angles of the crown and the pavilion. It is recommended that you use this HCA tool to shortlist the diamonds you are about to buy, then you can move on to observing the other aspects of diamond’s quality, including symmetry and polish. Although GIA grading report doesn’t show the quality of a diamond seen from its crown and pavilion degree angles, the company has a very useful tool to observe the stone’s cut quality. GIA Facetware is free and available online for you to assess a diamond’s sparkle value based on the cut. You will need to input your diamond’s details, such as the table size, crown and pavilion angles, star-length, lower-half length and girdle thickness, to this tool. 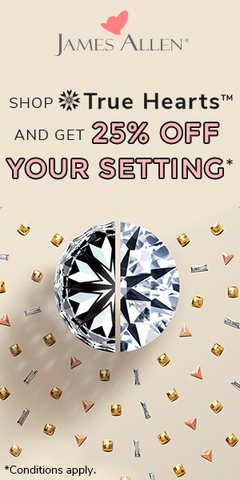 The result is obtained by comparing your diamond’s data with GIA’s vast database of diamond’s proportion sets. Then you will find out whether the diamond being tested has the cut excellence or not. When shopping for a diamond, you need to bear in mind that cut is what makes a diamond valuable. A good cut determines a good diamond with a well returned light. You may not be able to observe whether a diamond has a good cut on your own, especially when you are buying the stone from an online store. But you can always examine the report GIA or AGS issues for the specific diamond you are buying AND perform online tests with Pricescope tools or GIA tool to know the different qualities that the diamond offers. From here on you can be rest assured that you are purchasing this precious gemstone for what it’s worth. You are welcome to contact me with any question you have regarding the diamond you wish to buy. I just wanted to thank you for going to the effort of adding this information to the Internet. Very helpful and much appreciated.